xfce4 has default media key settings for Pragha music player. Although, if you use clementine music player you can use keyboard shortcuts to control it with DBus and MPRIS. If you use spotify, it is registered as org.mpris.MediaPlayer2.spotify on qdbus. 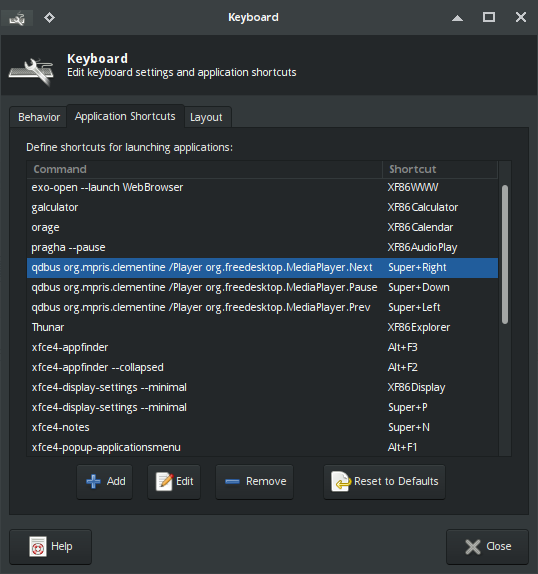 Published by rhnvrm 20 May, 2017 in foss, notes, tutorials, uncategorized and xfce and tagged fedora, foss, linux, music, productivity, tutorial and xfce using 71 words.